Carte Administrative et Physique de la France, Indiquant Les Canaux Les Rivieres Navigable Les Routes, Les Chemins de fer avec leurs Stations. This is an uncommon large format 1860 elephant folio map of France by A. H. Dufour. Essentially four separate sheets, it covers the whole of France including Corsica and parts of Spain, Germany and Switzerland. The first sheet (top left in image) represents northwestern France and includes two insets of Nantes and Rouen. The second sheet (top right) represents northeastern France with an inset of Paris and its environs. The bottom right sheet depicts the southeastern portions of France and includes two insets, one featuring Marseille and the other featuring Lyon. The last sheet on the bottom left is of southwest France. An inset on Bordeaux is included. Throughout, roads, canals, railways, rivers, cities and other topographical features are noted. This map was prepared by Auguste-Henri Dufour and engraved by Charles Dyonette for publication plate nos. 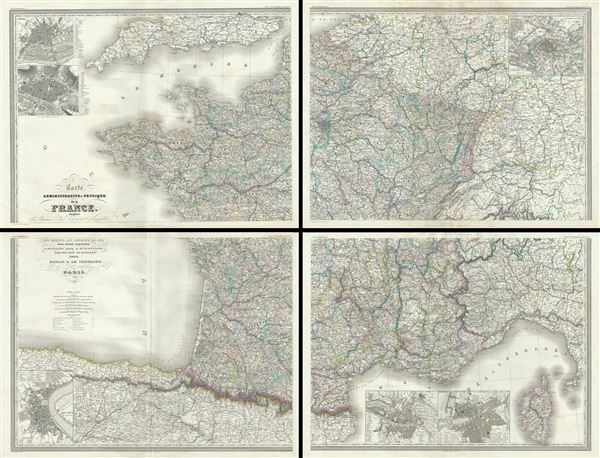 12, 13, 14 and 15 in Armand Le Chevalier's 1860 edition of Atlas Universel, Physique, Historique et Politique de Geographie Ancienne et Moderne. Very good. Set of 4 maps. Minor wear along original fold lines. Minor spotting at places. Rumsey 5020.019, 5020.018, 5020.017, 5020.016, 5020.015.